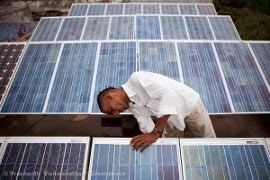 India added 111 MW of grid-tied solar photovoltaic (PV) capacity and 7 MW of off-grid PV in September 2013, according to figures released by the nation's ministry of New and Renewable Energy (MNRE). This is a slight decline from the previous month but an improvement on prior months, and brings India to 2.08 GW of grid-tied and 139 MW of off-grid PV. This includes 395 MW of grid-tied and 14 MW of off-grid added from April 1st through September 30th, 2013. Additionally, India added 100,000 square meters of solar water heating capacity, to bring the nation to a cumulative total of 7.27 million square meters. 270,000 of this has been added from April 1st through September 30th, 2013. MNRE has finalized regulations for phase 2 of the nation's National Solar Mission (NSM), however Request for Selection (RfS) documentation has not yet been released as of the writing of this article. NEW DELHI: The Solar Impulse - a revolutionary solar powered airplane which had completed its first cross-country journey in the USA in July - will make New Delhi and Varanasi its landing and departing destinations during its round the world mission in 2015. Idea behind this Swiss-made airplane, which had completed its US mission without using a drop of fossil fuel on board, is to demonstrate the capabilities of clean technology and renewable energy. The move comes at a time when the governments across the world are looking for alternatives of fossil fuel to not only fight the menace of climate change by drastically cutting greenhouse gas emissions but also to pull themselves out of the vicious trap of oil economy. Gregory Blatt, head of communication of this project, who was in India last week to get various clearances for its New Delhi and Varanasi stopovers, told TOI that the Solar Impulse is a kind of tool to tell the world about power and potential of clean energytechnology. Blatt said if an airplane could fly for such a long hour without using a drop of fossil fuel, then why can't a car run on solar power for 50 r more miles in one go. "Solar Impulse is not designed to carry passengers, but to carry a message. If we can do it in the air, we can do it in our daily life using clean technology", he said, explaining how this solar powered scientific marvel serves as "an Ambassador for renewable energy". The around the world mission flights will take place from beginning of March to end of the summer 2015. Landing and departing destinations are currently being identifiedfinalized in Europe, Gulf countries and China, depending on technical and operational considerations. In India, New Delhi and Varanasi have, however, been finalized for the mission. Crossing the Pacific is expected to be the most difficult phase of this mission as pilot will have to fly five days non-stop during this leg of the trip. Solar Impulse - having wingspan of a 747 aircraft, weight of a car and power of a scooter - is constructed in such a way that its thousands of solar panels across its wings can harness power from the sun during the day and its lithium-polymer batteries can store that energy for overnight trips. Bertrand Piccard and Andre Borschberg, co-founders and pilots of the Solar Impulse, who had completed the US mission in July, will fly the airplane in different legs of landingdeparting destinations during the 2015 around the world mission. Since each pilot will have to fly for four-five days during the circumnavigation of the globe, both of them will have to be trained in such a waycondition that they can fly the plane non-stop for five days. The Solar Impulse had proved itself for the first time in 2010 when it successfully conducted its first-ever historical 26-hour flight. Subsequently in 2011, its first plane - HB SIA - flew to Brussels under the patronage of the European Union and was also invited as a special featured guest to the Paris-Le Bourget International Airshow. Solar power will soon run Gurgaon railway station. Minister of State for Railways Adhir Ranjan Chaudhary Thursday laid the foundation stone for 25 KW solar power plant here, being undertaken under RITES' CSR and Sustainability Projects. In a first, the solar power plant will be set up on the platform's roof where the panels will be placed and solar electricity generated, an official said. Appreciating the efforts of RITES, the minister said of 365 days, India gets full sun for almost 300 days but the vast resource of solar energy potential remains unutilised. On the development of the railway station, he said Gurgaon is known for its IT hubs, multi-stored shining buildings and railways will spare no efforts in making sure the station matches the rest of the infrastructure. Chaudhry said by utilizing the platform roof, there is no issue of land acquisition and passengers can also get shelter from rain and sun while aesthetics of the station will improve. The project, even if small, holds large potential and railways will pursue similar initiatives either under corporate social responsibilities (CSR) of its public sector undertakings or on railways' own initiative. RITES chairman and managing director Rajeev Mehrotra said this is the first attempt to utilize a platform's attempt for placing panels and generating solar electricity. "If replicated on a larger scale, it could help in reducing the Indian Railways' carbon footprint and achieving the target of sourcing at least 10 percent of energy from renewable sources like solar power and biomass," he said. This solar plant is being installed with the assistance of BHEL electronics division, Bangalore and is fully funded by RITES. The project, costing nearly Rs.60 lakh, will be completed by the end of 2013. The successful completion of the project will open up new possibilities for these kinds of projects for the railways and RITES. An energy audit tool that more accurately pinpoints potential energy savings while potentially costing 35% to 75% less than traditional audits is set to hit the multi-billion-dollar energy retrofit industry next year. The simuwatt Energy Auditor software package was developed by the Energy Department's National Renewable Energy Laboratory (NREL) in partnership with Denver-based software developer concept3D. 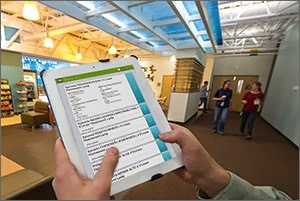 simuwatt Energy Auditor replaces the clipboard-and-pencil approach of most building audits with a package that uses sophisticated, comprehensive computer modeling to find more potential energy savings. The commercial buildings sector in America alone represents 7% of total energy consumption worldwide. Commercial buildings in the United States consume about $134 billion in electricity each year for lights, computers, office machines, appliances, and the like, according to the Energy Department's Buildings Energy Data Book. Even a modest reduction in electricity costs would mean huge savings. At the individual building scale, a 200,000-square-foot office building that pays $2 per square foot in energy costs annually can save tens of thousands of dollars of net operating income by reducing consumption modestly. And that doesn't include the benefits of reducing greenhouse gases and increasing the comfort level of building inhabitants. The increasing share of Vacuum Tube Collector (VTC) systems imported to India took the Indian government to specify the standard requirements for evacuated solar collector tubes for non-concentrating solar thermal collectors and related storage tanks. The industry and the manufacturers welcomed the publication of the new standards, released for public debate in early March 2013, as the aim of the Indian Ministry of New and Renewable Energy (MNRE) is to keep low-quality systems out of the sector. The MNRE had been working for a long time on devising new standards which now are imposed to manufacturers importing the tubes to show reports of testing laboratories from the country of origin. These reports will be approved by agencies like the Regional Test Center. The MNRE has released three sets of standards: Evacuated tube standards (MNRE STD 01:2013), Storage tank standards (MNRE STD 02:2013) and System standards (MNRE STD 03:2013). Storage tanks with a capacity of up to 500 litres can be tested every two years either at an approved laboratory or at the manufacturer’s laboratory. Tests for tank capacities of more than 500 liters are to be carried out as per agreement between the manufacturer and the user. The selective coating of the tube is to have an absorptivity of 0.92 or higher at AM 1.5 and an emissivity of less than 0.07 when tested. A label on each evacuated solar tube, showing the manufacturer’s name or logo, the batch number and the date of production is also required. 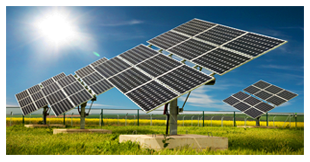 The Karnataka Renewable Energy Development Ltd. (KREDL) is considering the possibility of making solar energy available in remote hamlets at around 90 per cent subsidised rate. Disclosing this while addressing members of the Federation of Karnataka Chambers of Commerce and Industry (FKCCI), KREDL managing director G.V. Balaram said the idea was to get 60 per cent subsidy from the Power Finance Corporation (PFC) in addition to the 30 per cent subsidy from the Ministry of New and Renewable Energy. 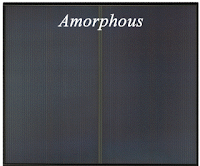 Amorphous cells are munufactured by placing a thin film of amorphous (non crystalline) silicon onto a wide choice of surfaces. These are the least effient and least expensive to produce of the three types. Due to the amorphous nature of the thin layer, it is flexible, and if manufactured on a flexible surface, the whole solar panel can be flexible. 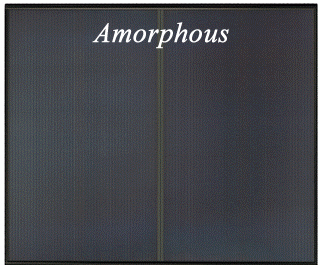 One characteristic of amorphous solar cels is that their power output reduces over time, particularly during the first few months, after which time they are basically stable. The quoted output of an amorphous panel should be that produced after this stabalisation. 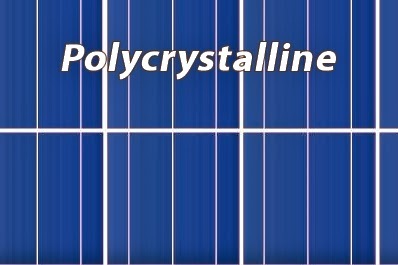 Polycrystalline (or Multicrystalline) cells are effectively a slice cut from a block of silicon, consisting of a large number of crystals. They have a speckled reflective appearance and again you can you see the thickness of the slice. These cells are slightly less efficient and slightly less expensive than monocrystalline cells and again need to be mounted in a rigid frame.